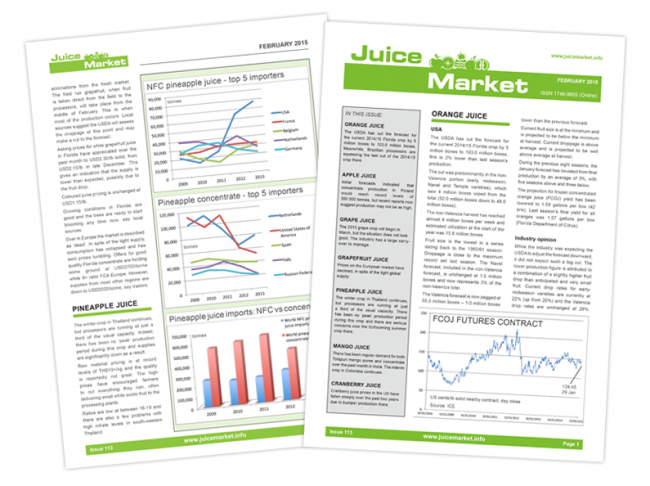 Juice Market delivers unique information about the juice market. If you’d like more information on subscription as well as a sample copy of the publication, please contact us through the details below or fill out the form on the right. We speak to both producers in the key global producing regions and buyers in the main importing countries to bring you a balanced picture of the market. Cross referencing information from all of the trade data sources that are available to us is paramount. An essential tool for traders and producers alike. We have historical trends on all products going back at least a decade. We often feature special articles on innovations, future market trends etc… the frequency and diversity of these articles is something we are looking to expand on in the future.